The DOE and SEIA have set their targets on $.14 / kWh cost for solar plus energy storage. The aim of the program is making renewables cost-competitive on the nations electric grid and working with utilities to make that happen. 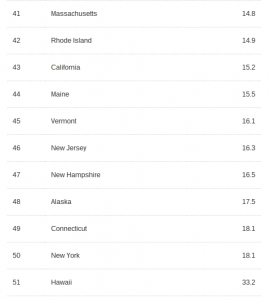 However, the cost of energy from the grid is already over 14 centers / kWh in at least 11 states. $.14 is an aggressive target for solar plus energy storage. While solar has a track record of cost declines, it’s much more difficult to see where energy storage is headed. This marks a significant shift in DOE’s focus from solar PV cost to making sure the grid can handle high levels of variable renewable energy. It’s notable that, while they can’t take all the credit, the original Sunshot goal of $1 / installed watt is on track for success. 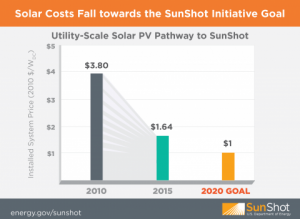 The Sunshot Goal of 14 pennies per kilowatt hour are significant. The target would already spark mass grid defection in 11 US states. By the time the goal is met, power prices in the united states could be higher than solar plus storage everywhere. The Rocky Mountain recently put out a report about the economics of grid defection, claiming tipping point states like Hawaii and New York were almost there and many more would follow. 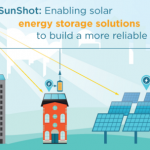 The Sunshot SHINES program could move the tipping point ahead in many states. The difference between ‘more expensive’ and ‘less expensive’ has massive implications to the energy and utility industries. 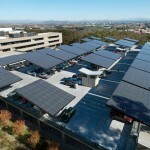 Companies are already claiming to be able to disconnect large industrial users from the grid at a profit. SunShot notes that the number of solar jobs have increased 10 times faster than the general increase in jobs in the US economy. Every day, 56 solar jobs are created. Every 4 minutes, another house goes solar. These jobs cannot be outsourced, says President Obama. The SunShot initiative plays a key part of the presidents climate change plan. He set off early on to double the amount of energy on the electric grid coming from renewable sources. Grid defection was not a part of the plan, which seeks to make solar competitive on the grid. However, as utilities pull back net metering, the Sunshot targets are notable for their implications. See the economics of grid defection by the Rocky Mountain Institute here.